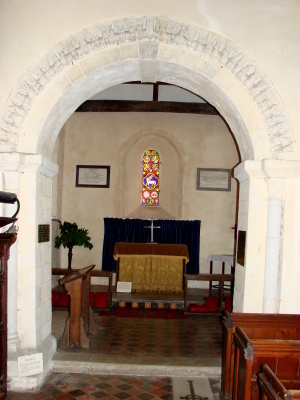 The small mid-C12 church has a fine south doorway and chancel arch. An early C13 south arcade leads to an aisle rebuilt in the C19. The fine font is C12. Tortington lies by a farm south of Arundel, half a mile from the remains of Tortington Priory, an Augustinian house. The church belonged to the priory by 1380 (VCH 5(1) p222) and though the dedication was formerly to St Thomas, it came to share the priory’s dedication of St Mary Magdalene. 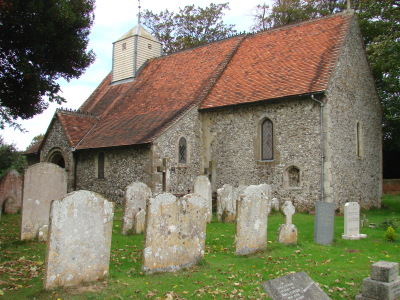 The church was made redundant in 1978 and is vested in the Churches Conservation Trust. Nave and chancel date from c1140. The round-headed north nave windows and the single east one have been enlarged, but without changing the rere-arches. Steer suggests this was done in the early C13 (2 p1), but the presence of brick suggests a later date, possibly the C16. 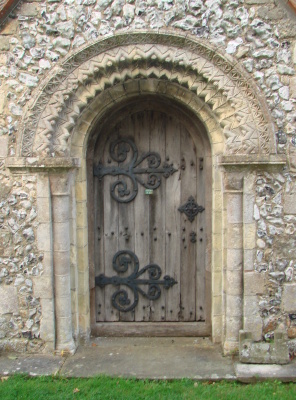 The restored C12 south doorway has been reset more than once. It is handsome, of Caen stone, with two orders of chevrons on the head and a hoodmould decorated with a four-leafed emblem. The outer order is enriched with pomegranates and the inner one is on shafts with scallop capitals. It has been dated to c1140 and linked to contemporary work at Chichester cathedral (www.crsbi.ac.uk retrieved on 22/4/2013). 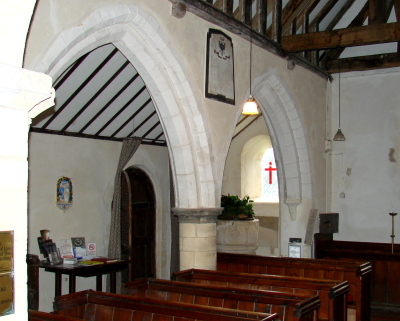 The chancel arch has been dated about ten years later and is linked to the font (see below), rather than the doorway. It demands closer study than it has yet received. The head has a plain inner order and an outer one of closely packed beakhead, with jambs that have angle-shafts with renewed leaf capitals and square abaci. Beakhead is rare in the south (it is otherwise found in Sussex at Arundel and at New Shoreham). The keystone bears the arms of the Leeves family, lords of the manor since 1706, and, on the chancel side, the date 1750. Conceivably the keystone was inserted, but the head is distorted and there are two varieties of beakhead, arranged irregularly, so the whole arch was probably rebuilt, an early instance of antiquarianism. A south aisle was added in the C13 with a west lancet. The much retooled arcade has double-chamfered heads and square responds with semi-octagonal corbels. The round pier is barely 5ft high, with a spurred base, and the abaci of pier and corbels were painted grey, probably in the C19, though in fact of sandstone (1 p173). The nave roof with crownposts may be C13. In the chancel, a depressed recess on the outside south wall (actually an aumbry) next to the now rather faint outline of an arch are C15 or C16 and show there was a south chapel. It may have been removed with the aisle, probably between the C16 (it is not mentioned in any archdeacon’s presentments, but that is no proof) and 1782, when the Burrell Collection drawing shows it definitely gone. As chapel and aisle were joined, its removal may also have been in 1750. Whatever the date, the south doorway was reset in the blocked arcade. Adelaide Tracy (II p62) (1851) shows it along with round and square-headed windows and a similar south chancel window. The belfry was altered between the C16 and the C18. In 1546 it was lead-covered (VCH 5(1) p224), but on the Sharpe Collection drawing (1804) it is boarded as today. The church was restored in 1867-68 (WSRO Par 198/4/5 (cutting from the West Sussex Gazette)) by an unknown architect. He may in fact have been a local builder, for a report of 1876 in The Builder (34 p899) mentions work by one 12 years previously. The name of G C Coote has been linked to this (www.crsbi.ac.uk retrieved 22/4/2013). This was presumably George Cousins Coote (b1814/15), a farmer in the parish with 370 acres in 1881, but he must have been the benefactor rather than the architect or builder. Only after work started was the blocked arcade discovered and it was decided to rebuild the aisle with lancets. Other windows were altered, e g the east (CCC file) and south chancel ones, and the roofs were stripped; that of the chancel looks as if it was rebuilt. Though the work was thorough, much of the atmosphere of the church remains; in particular, the retention of the plaster makes a big difference to the interior. In 1904 further work by P M Johnston included rebuilding the belfry (ibid). Aumbry: (South chancel exterior) See above. Bench: (South aisle) Single C15 bench with traceried ends. Font: Mid-C12. The deep arcaded round bowl has scallop capitals on the columns and cable-moulding round the rim. The columns extend the full depth of the bowl and alternate with large pendant leaves that extend half way down only, creating a most unusual effect. 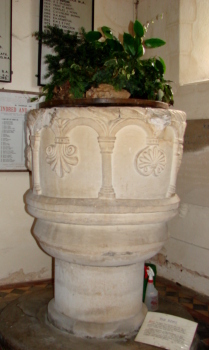 The font has been linked by George Zarnecki to a group found otherwise mostly in Devon (www.crsbi.ac.uk retrieved on 22/4/2013). At some time the bowl has been broken in two and re-assembled. 1. (East window) Though Lower records ancient glass (II p207), the present Lamb of God, surrounded by religious and heraldic emblems including those of the four Evangelists at the top, is by T Willement (www.stainedglassrecords.org retrieved on 16/2/2015). and dates from 1836, well before the restoration of 1867. 2. (North nave, first and second windows) C E Kempe, not dated, but made in 1896 (Collins p315). The figures are set in patterned quarries. Pulpit: Simple early C17, decorated at the top only.